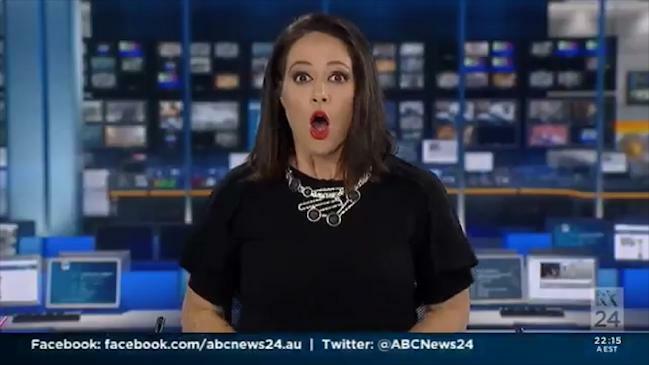 NATASHA Exelby has paid a high price for her weekend blooper, after the humourless management at ABC24 banned the newsreader from playing any future on-air role. Exelby, who only recently returned from a foreign correspondent and anchor role with Turkish broadcaster, TRT World, was today told she has been axed from newsreading duties, after being caught off guard during a live news shift on Sunday. In vision which has since gone viral, the former Wake Up! co-host is seen looking startled as she suddenly realises the cameras have returned to her after a prerecorded package has finished. It's a slip-up almost every newsreader in the world has committed but rarely costs the TV presenter their on-air job. The decision to bench the freelance newsreader and producer comes from the same broadcaster widely criticised for the more serious charge of failing to vet the audience of its panel program, Q&A and allowing one-time terror suspect Zaky Mallah to join the live TV debate. The error, described by then Prime Minister Tony Abbott as "completely incomprehensible" and compounded when it was rebroadcast on ABC24 saw no one from the program sacked. While most viewers laughed off Exelby's innocuous gaffe, posted by the ABC's own Media Watch program - it sparked waves of support, rather than acrimony, for the "mortified" news professional. SBS newsreader Janice Petersen tweeted a screen grab of herself caught putting lipstick on while live, writing in solidarity: "it happens".